For people who love to do DIY projects and do simple house renovations on their own, a paint sprayer is an essential tool. You don’t have to be an expert painter to paint correctly. If you want to complete a certain task and achieve professional results, you’ve got to choose the best paint sprayer for you. Hence, we’ve created a list of the top 10 best paint sprayers available in the market today. 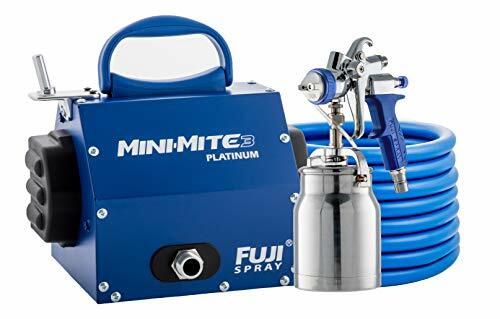 You may be overwhelmed with the numerous options available to you, but the following are the best paint sprayers that you should consider. 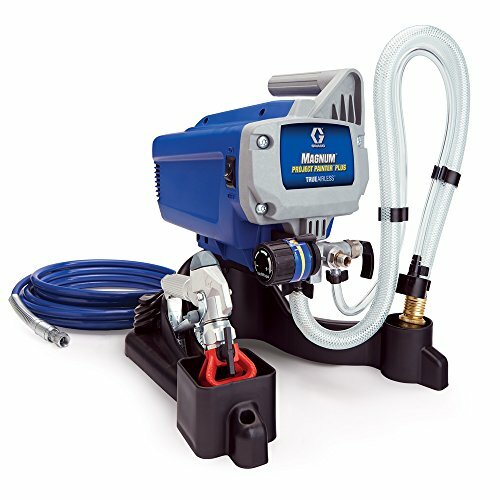 First on the list is the Graco airless paint sprayer that features a fully adjustable pressure to give you optimal control. In that way, you can achieve the desired paint flow in any of your project sizes. It also features a stainless steel piston pump that allows you to spray paint at higher pressure. The flexible suction tube functions to spray directly from a 5-gallon paint bucket. The annual use recommendation for this product is up to 125 gallons per year. It also has a power flush adapter that will connect to the garden hose for a hassle-free and fast cleaning maintenance. This spray paint is compatible with up to 75-feet paint hose that allows you to extend your mobility when doing projects. Next, we have the gravity HVLP spray system from Fuji Spray. This professional non-bleed spray gun with adjustable pattern fan control and 1.3mm air cap set is perfect for DIY projects in your household. It also features a 400cc gravity cup and metal turbine case with handy gun holder. The 25 feet hose includes an air control valve to reduce overspray and bounce back, allowing you to achieve professional results and saving paint in the long run. The price is budget-friendly for a hobbyist. It is powered by a heavy-duty 1400-watt two-stage motor that can last for a long time when used correctly. The turbine filters are easy to change as well. Check out this maxum HVLP spray gun from Titan. It features a click-in air cap for quick pattern adjustment and eliminates the guesswork to achieve desired results. It also has a stainless needle and nozzle that can last for a long time with proper use and maintenance. The patented dual-pivot trigger is designed to reduce the pull and fatigue when using the product. Its solvent-proof Teflon seals mean no swelling at all. And it also features the 2-stage trigger (air and material). The check valve is safe to wash and can even be replaced when needed. It has a multi-position swiveling pick-up tube and comes with a #3 pro set upon purchase. This professional spray gun from Fuji Spray features a convenient side pattern control knob. In that way, you can adjust the size of the fan pattern from small to large, depending on what your project requires. 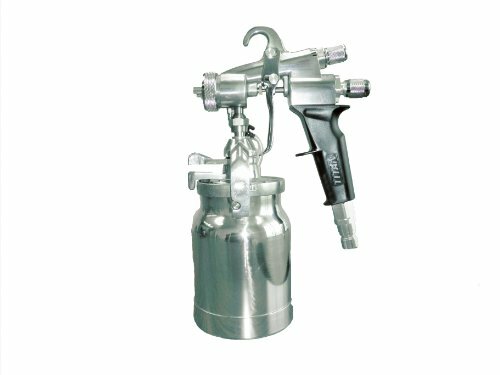 This non-bleed and lightweight spray gun with an ergonomic stay-cool handle provide optimal comfort and less fatigue when using the product. It also features a platinum turbine with heat dissipation box and an all mini-mite platinum model for noise reduction covers. It’s portable and easy to transport, an ideal choice for professional painters. The standard air cap set #3 is for general purpose excellent finishing. It requires little to no maintenance, and its heavy-duty metal case with gun holder is built to last. Among all the paint sprayers that we’ve reviewed so far, this model features a unique method of removing heat and lessening the fatigue. 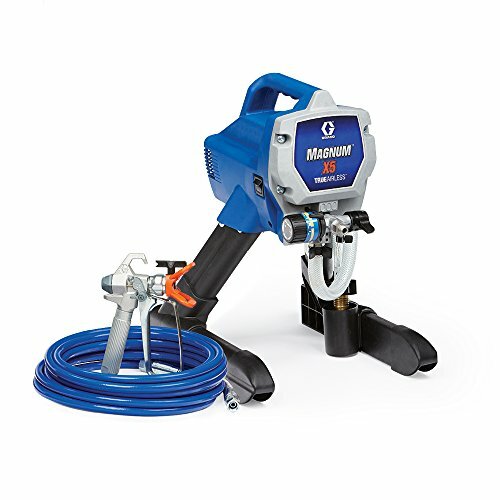 Another product from Graco is this all-new project painter and paint sprayer in one unit. You can spray directly from 5-gallon paint tub. The package includes an SG2 metal spray gun, 515 RAC IV tip, tip guard, 25-feet hose, and quick start-up guide perfect for beginner’s use. We also like its flexible paint supply hose allows you to spray directly from the 5-gallon paint tub. You can connect the paint container to the sprayer so that you can move it around freely while on the job. 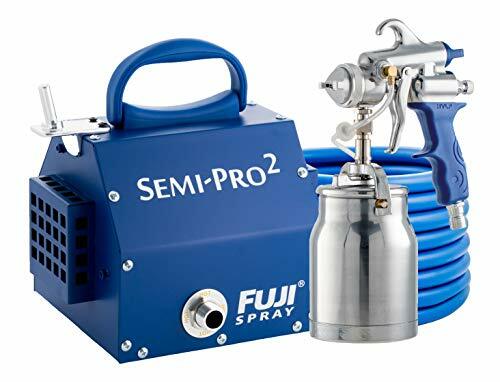 The sprayer includes SG2 metal spray gun, tip guard, cleaning adapter, hose, storage fluid, and a complete guide that’s ideal for beginners. 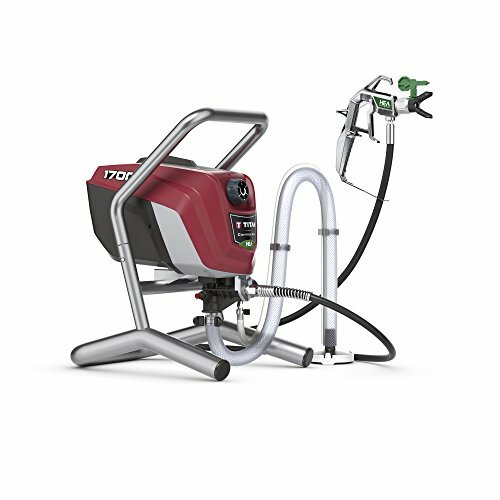 This highly-efficient paint sprayer from Titan Tool provides the same technology with a traditional airless paint sprayer in a lesser price! For homeowners out there who want to save a little, this product is for you. Compared to other products we’ve reviewed, this unit can decrease overspray up to 55% less. You also gain optimal control thanks to its softer spray to achieve a consistent finish. The durable pump can last for up to 3x compared to competitive sprayers. You can replace the fluid section easily to maximize the span life of your sprayer. There is a Sureflo pusher valve that will ensure proper priming at all times. The maximum operating pressure for this sprayer is 1500 PSI. Buyers can enjoy up to 2-year limited warranty upon purchasing the product. 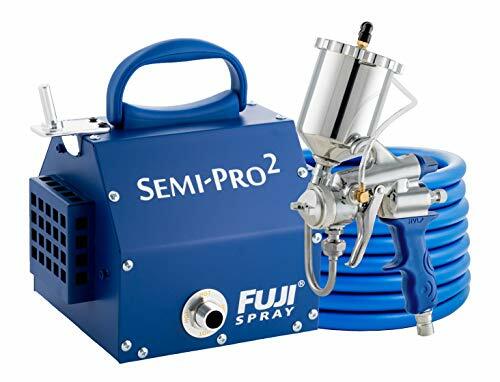 This professional non-bleed spray gun from Fuji Spray is ideal for both professionals and beginners. It features an adjustable pattern fan control to achieve desired painting results. Aside from that, a 1.3mm air cap set is already installed along with a 1 qt. bottom feed cup. The metal turbine case with handy gun holder is built to last for a long time. 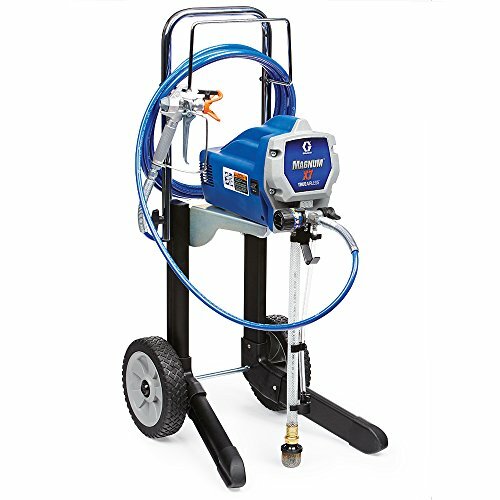 This paint sprayer includes a 25-feet hose with an air control valve to reduce over spraying. Technically, it can save your money in the long run and rest assured that in all of your painting jobs, no paint is wasted with this spray system. 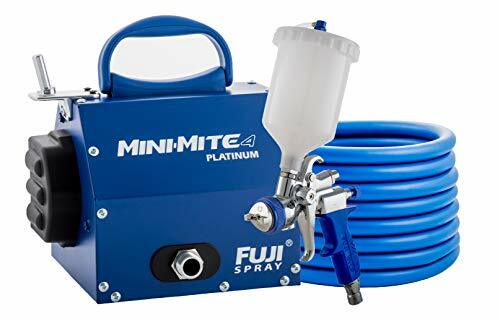 For a hobbyist, small business owners, or homeowners who wanted to achieve professional painting results without spending a lot of money, this paint sprayer powered with a 1400-watt two-stage motor is recommended for you. If you like the products from Fuji Spray, you will also like this gravity HVLP spray system from the same manufacturer. This professional gravity spray gun features a side pattern control knob that will allow you to control the fan size pattern from small to large. Ideal for home and commercial use, the non-bleed and lightweight gravity spray gun have an ergonomic stay-cool handle to ensure optimal comfort while you are using the product. It will also help to increase your productivity. The platinum turbine is easy to replace and even features a heat dissipation box. Fuji’s mini-mite platinum models are enhanced to reduce the noise while on the operation. This product is portable, thanks to its compact size. It is suitable for waterborne and solvent-based coatings. You can use it in a variety of materials (from high to low viscosity), ensuring that you can use the sprayer for any paint job. Lastly, we have an airless paint sprayer from Graco that features an adjustable pressure to provide optimal control when painting. It also has a stainless steel piston pump that allows you to spray paint at a higher pressure without the need for thinning. The flexible suction tube provides easy access to paint directly from a 5-gallon paint bucket. Annual use recommendation is up to 125 gallons per year. It has a power flush adapter that will connect to the garden hose, making cleaning maintenance a breeze. This paint sprayer can support up to 100-feet of paint hose, allowing you to spray paint even third-story houses. It’s an ideal choice for professional painters who do not want to burn a hole in their pockets to achieve desired results. The RAC IV switch tip allows you to reverse the tip when clogged to ensure that you can continue working.